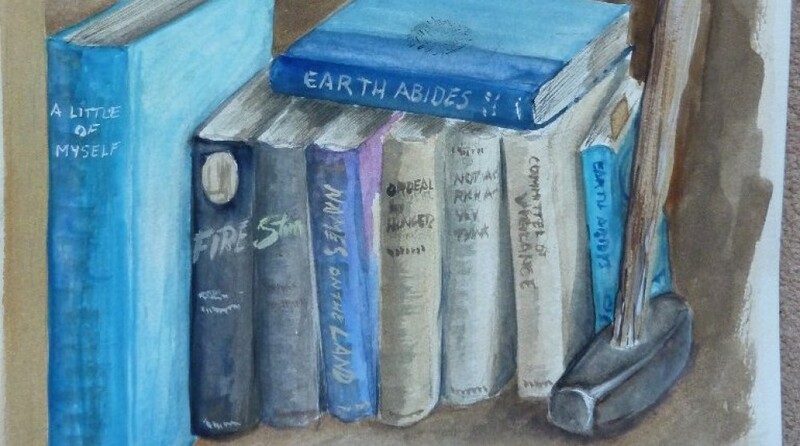 The painting of George R. Stewart’s books and the Hammer of Ish that heads this weblog is the work of Steve Williams. Steve grew up in Liverpool, went to art school there (with Lennon and McCartney), married Carol, found a good job, and raised a family. He discovered George R. Stewart along the way, becoming quite a Stewart scholar. I met Steve when he traveled to Berkeley to research the Stewart papers at the Bancroft Library. Later, when I went to Britain, Steve, Carol and family hosted me on a tour of Beatles sites in Liverpool and Castles in Wales. He paints a wide variety of subjects: Lancaster bombers heading out on a raid, a ferry crossing the Mersey River, landscapes of this and other worlds. One subject he’s focused on recently is Bletchley Park, where British intelligence successfully broke the German codes in World War II. He’s donated several paintings to the site, which were sold to raise money to support its restoration and operation as a museum and education center. Here’s a site which showcases the Bletchley paintings. One of Steve’s Bletchley Park paintings is of Alan Turing. Turing played a major role in the code breaking, a role now showcased in The Imitation Game, when he refined the Polish Bombe Machine. 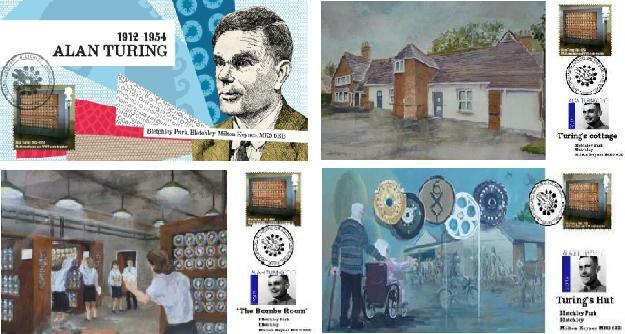 With the growing interest in Turing, and Bletchley Park, Steve was asked to donate several paintings to be used on stamps honoring the role played by place and person. The stamps were released recently: Here’s the order form. The “Fellowship” of George R. Stewart is populated by people like Steve – creative people inspired by the remarkable ideas and books of Stewart, who express that inspiration in personal acts of creativity: Composer Philip Aaberg, NASA-JPL Ranger Mission Project Manager James D. Burke, Walt Disney, Jimi Hendrix, Stephen King, and many more. Here’s the link to Philip Aaberg’s review of the GRS biography, Bonds of Literature and Music Run Deep. One of the greatest joys from researching and writing a book comes from the remarkable encounters along the way of the work. In the case of the Stewart biography, one of the most enriching encounters was with Grammy-nominated composer and musician Philip Aaberg and his family. Later, working in Missoula, Montana, I went to the local Hastings Book and Music store (one of a fine small chain of bookstores usually found in small college towns) to look for Aaberg’s recording. One of the bookfolks directed me to Napoleon (whose last name I have forgotten), their music & jazz expert. Napoleon quickly found a recording which included Aaberg’s composition — but Hastings did not have a copy. So Napoleon called Rockin Rudy’s, discovered they had a copy, and sent me to that store. Later that day, for the first time, I heard Phil Aaberg’s musical response to the book. The music was so rich and inspiring that it went on the desktop, to be played whenever there was a need for inspiration, or the calming that precedes inspiration. After a little research, I found Philip Aaberg’s business phone number on the web. I called. His wife, who manages Sweetgrass Music, answered the phone. I explained to Patty why I was calling. She suggested that I call Phil at a pre-arranged time, and interview him. Not long after, I talked with Phil at length about his interest in Stewart. That first conversation would lead to visits with Phil, Patty, and Jake at their home in Chester, Montana, Phil’s participation in the first George R. Stewart Symposium at CONTACT, and wonderful stories for the Stewart Biography. Now, Phil has written the first review of the book that’s been published. And well-published, too, in The Great Falls Tribune, which is part of the Gannett chain. Phil’s review of the book takes a Stewart-like approach; it’s interdisciplinary, weaving music and literature together, showing the effect each has on the other. He includes a reference to Jimi Hendrix, another musician inspired by Earth Abides (said to be Hendrix’s favorite book), making the point that the same work of literature can influence composers with two very different styles to create their own responses to it. George R. Stewart would be very happy with this review. As am I, and grateful to Phil for taking the time to write it.